2 RS232 serial ports, for connection to printer, PC or PLC, radio module and optinal interfaces. 1 RS232 serial port (optional RS485), for connection to weight repeater, remote scale, badge reader or digital load cells. Optional Bluetooth connection, for quick wireless programming of the activities and the formulas, through PC or tablet. 59-key QWERTY and functional alphanumerical waterproof keyboard. Highly efficient BLU LED display with digits 15mm high. Configurable screens. Blue backlit LCD graphic 25x100mm display. Easy to clean ABS waterproof IP65 enclosure; resistant to harsh and corrosive environments (IP40 on version with thermal printer). 2 independent analogue channels for reading of the weight. Connection with up to 16 analogue load cells of 350 Ohm (45 load cells of 1000 Ohm) and with the main digital load cells available on the market. 110-240 Vac power supply; built-in rechargeable battery for use in prolonged absence of the power mains. 3590EQ Indicator with QWERTY keyboard and AF03 software. ABS IP65 case , 59-key keyboard, LED display and graphic LCD display. 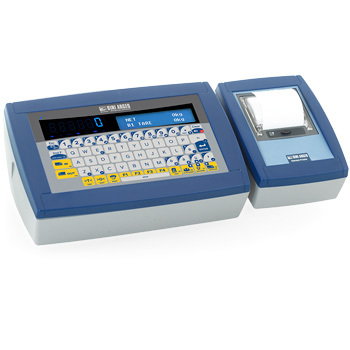 3590EQP Indicator with QWERTY keyboard, integrated printer and AF03 software. ABS case, 59-key keyboard, LED display and graphic LCD display. USBC (S1) Built-in USB port kit for data storing on USB key. Fitted with USB key for PC. PR80 (S1) Thermal printer with print cutter. LX300PRO (S1) Dot matrix impact printer. 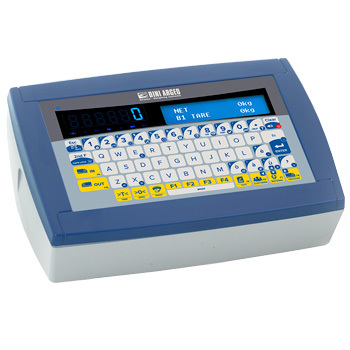 TM295 (S1) Dot matrix impact printer. RSCBLP (S1) RS232 cable l=1,5m for LP542xx, SMTPLUS, PR80 printers. RSCBLP10M (S1) RS232 cable l=10m for LP542xx, SMTPLUS, PR80 printers. RSCBUSBPG (S1) USB PC/RS232 converter cable, l=1,5m, with PG9. USB/RJ11 connector. For the connection to weight indicators with IP65 and IP68 protection system. PROFI232-1 External RS232/RS485/PROFIBUS interface for DIN bar. Connectable to the indicators with Profibus protocol. With UL marked PCB, Terminal block, plastic box and labels (if expected). OBCLTP (S1) ABS 3 way control light (for indicator with relais output). Acustical alarm, connexion cable, power supply from indicator. PG7P 10 PG7 ABS cable gland set for weight indicators.